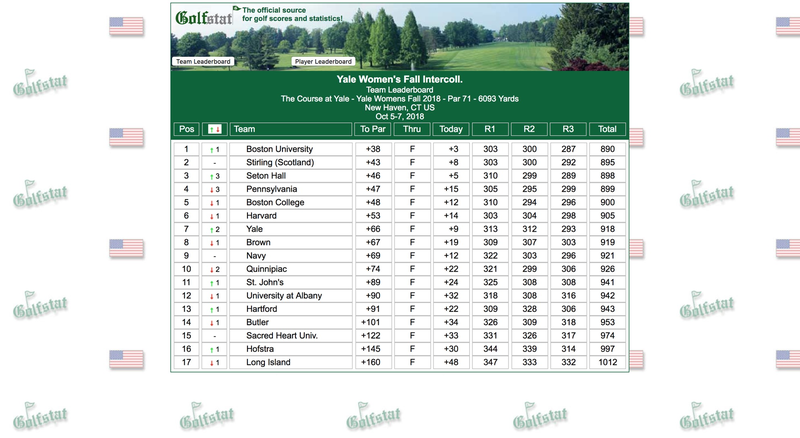 NEW HAVEN, Conn. — The Sacred Heart University women's golf team concluded its play at the Yale Women's Invite, hosted by Yale, finishing 15th out of 17 teams on Sunday. The Pioneers finished with a team score of +122 and a 974 total. Boston College won the tournament, finishing 38-over par and a 890 total. Chelsea Sedlar led the way for the Pioneers, finishing tied for 38th out of 95 competitors, shooting 20-over par and 233 for the weekend. Sedlar shot best in the final round, where she shot a 6-over. Hana Bowman finished in 68th in the tournament after shooting 33-over par and 246 for the weekend. Bowman closed the weekend strong, shooting a 76 on the final round. Christina Massei finished third in SHU's grouping and tied for 69th overall, shooting 34-over par. Lauren Pelster and Maya Isom rounded out the group, shooting 40-over par and 47-over par respectively. The Pioneers are back in action on Sunday, Oct. 21 when they close the fall season hosting the SHU Fall Classic at the Great River Golf Club in Milford.